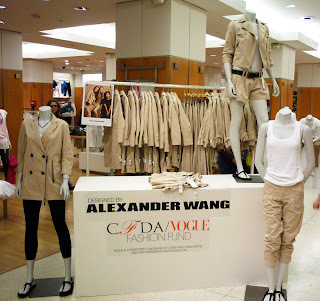 Fashion Herald: Gap CFDA Unzipped. Really. 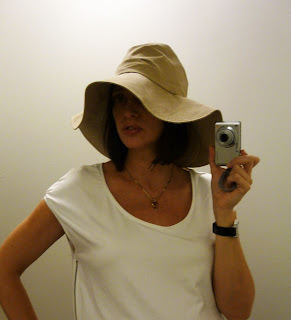 Stopped by Gap Herald Square today to check out a little CFDA Collection, and you know I had to get a Swanepoel hat. $39.50, and I'm totally torn. Which to buy? I love them both. And that zipper shirt was bought at H&M back in January. I just zip it up for more belly space as I get bigger. These hats are sized (S/M, M/L), so run and get one soon. The Wang jackets? Well, I'd get both if I could. Just $88 and you'll get years of wear out of them. I can't say they are crazy special, but they are great khaki coats. 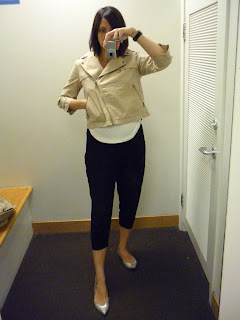 I couldn't believe I could zip up the moto jacket, makes me wonder about the fit for the rest of you! But it's not a tight-waisted jacket, which I like. The cut suits the fabric. No excess buckling in the back, either. 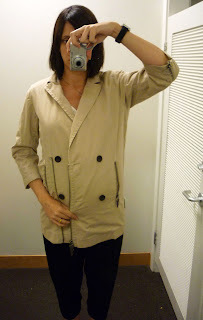 What a great, casual city jacket. Nope, not zipping up! The Vena Cava dresses are perfect. The zipper dress is killing me, I really want to zip it on. Again, both are $88. This is such a reasonably priced collection. Go and take advantage of this recession pricing and pick up these pieces. No misses as far as I can tell. Tomorrow I'll try and scare up an office model to try on the dresses, pants, and shorts. Sources say the dresses are going like hotcakes up on 5th & 54th, but on 34th we like the pants. So if you couldn't find your size in Vena Cava up north, be sure to check out the Herald Square store. OMG!!! The hat on the left is so cute and chic...I just love it! You look fabulous. Just fabulous! Get the bigger, floppier hat. SO cute on you. Ooh, I got my Sole Mates, too. THANK YOU, beautiful! It's good to know you two will be protecting your heels all summer long! I'm curious to see how they work! I love the second Vena Cava dress, just lovely. 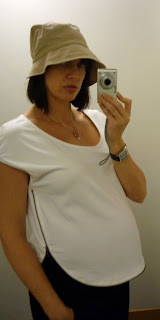 You look great in the zipper top by the way, nobody does maternity better. The hat on the left!!! I like the hat on the left. You are so beautiful you know? Even more right now with the baby! 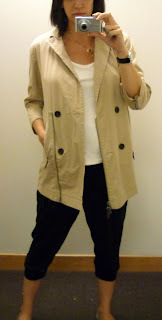 Floppy hat and the short biker jacket looks great on you! i second (or third.. or possibly fourth) the hat on the left. yes, floppier is better -- at least when it comes to hats and not uh... anyway. would you believe there's no gap that i can get to in phoenix by public transport, so i was forced to go online. 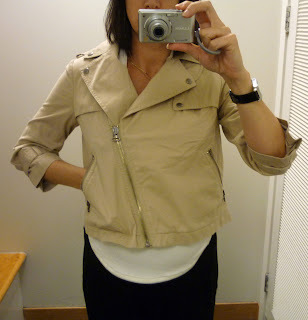 i was about to hit the button the moto jacket and one of the VC dresses until i remembered how gap vanity sizes. your demo with the moto jacket confirmed my suspicions! glad i didn't buy it even though i really liked the style. of course, i also realized i'd have no use for a jacket ever again, which was really my reason for not buying anything with sleeves right now. I thought I'd love the Vena Cava dress and ordered my normal size (6) and a size up, just in case. The 6 was too small to even try to zip up. And the 8 was awfully snug too! I was surprised at how slim the fit was. I would have sucked it up and ordered the 10, but the quality of the dress wasn't that great. Even the zipper was already pulling apart from the dress on one of them. Needless to say, I was disappointed! Need. Vena. Cava. Number. Two. For. September. Honeymoon.